Welcome to Point 262 - This beautiful 1 bedroom 1 bath has it all! The open concept living space is perfect for entertaining - The kitchen features a Statuary stone waterfall island, professional grade stainless steel appliances, and gas cooking with vented hood. The bathroom has radiant heated flooring and a full sized washer and dryer. The bedroom has ample closet space and access to the units private balcony. 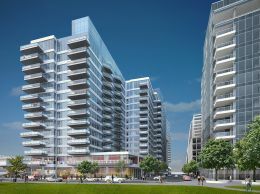 The building has a beautifully landscaped common roof deck with amazing city views, dedicated bike storage, fitness room, and part-time concierge. The unit comes with 1 assigned garage parking space and 1 assigned storage space. Conveniently located near the Twin City Plaza and Lechmere T stop. The information in this listing was gathered from third party resources including the seller and public records. Listing information provided courtesy of Andrew Disa of Gibson Sotheby's International Realty. MLS Property Information Network, Inc. and its subscribers disclaim any and all representations or warranties as to the accuracy of this information.